Being let down is a universal human experience. But whether you want something you can’t have or you’ve got no clue what you want, disappointment can also mark the best path forward. While thinking about disappointment, I decided to look up its definition and etymology on the Internet. Much to my surprise, one of the searches that Google suggested was “Disappointment Island.” Well, I had to click on that, didn’t I? It turns out Disappointment Island is one of the seven Auckland Islands off the coast of New Zealand, and it was the location of many shipwrecks. So many wrecks occurred in this area that the New Zealand government regularly visited these islands and set up depots, stocked with food, clothing, and tools for the use of castaways waiting to be rescued. It turns out that the disappointment of being shipwrecked, which I imagine would be considerable, was survivable if one had provisions. And therein, of course, lies the moral: If we have the provisions to deal with disappointment, it is workable. Indeed it is a universal human experience. So finding ways to work with our disappointment seems not just important but necessary. One of the most common sources of disappointment is not getting something that you want in life. It might be as small as not finding your favorite brand of peanut butter at the grocery store or not getting the gift you had really wanted for your birthday or at Christmas. Dang, you didn’t get that device you were coveting. It could be much bigger: Not getting a promotion you’d hoped for at work, not getting into the college of your choice, not winning an election, or being turned down when you propose marriage to someone. Closely related to not getting what you want is getting what you don’t want. Nobody wants a flat tire; nobody wants to get stomach flu. Nobody wants to flunk out of school, get cancer, or get arrested. Feelings of disappointment may have shades of anger, sadness, emptiness, or dejection. You might take a stiff upper lip approach to your disappointment, but it will probably be a quivering lip. If you book a venue for a lecture or a concert, and the room is only half full, you might say, “That was a disappointing turnout.” And someone might say back to you, “What did you expect?” That doesn’t mean they’re asking you literally what you expected, but they’re telling you that you had unrealistic expectations. It could mean you didn’t do enough to publicize the event, so you should have expected poor attendance. There’s a strong relationship between expectations and disappointment. Expectations may arise in the present, but they tend to be future oriented—they set us up for disappointments to come. It may be helpful to look at how our thoughts of the past, the present, and the future relate to expectation and disappointment. When we look more closely at disappointment, we can see how much we judge both ourselves and others when things don’t go our way. Expectations set us up for disappointment. Blame compounds our disappointments. You can see this in the littlest blames and judgments: You make a reservation for dinner, but when you get to the restaurant, they can’t find your reservation and there are no tables available. Somebody has to pay! With many smaller disappointments, humor is a good salve. Really, is there nothing you can put on your burrito to replace the brand of hot sauce you just ran out of? Isn’t it even a little bit amusing that you’re so fixated? A disappointing vacation, one that didn’t turn out well, may become the source of hilarity later. In our family, we laugh about a series of “death marches”—hikes that went horribly wrong. When one of these events happens to you, in the present, can you see even a glimmer of funniness in it? Daily disappointment is often connected with the breakdown of a habitual pattern. When you can’t follow a daily routine or habit, it’s very irritating—and that irritation is a particular kind of disappointment that we all know. If you’ve been wearing the same brand and style of sneaker for the last 10 years, and suddenly, it’s no longer being made, yes, it’s disappointing. But not getting what you’re accustomed to also wakes you up. You have to look around and see what else is available. You may not want to have a different drink at the coffee shop. Half awake, you just want to put in your order and get your cup of Joe. But when they stop carrying your favorite dark roast, you have to look at the menu and consider the alternatives. Disappointment can be very refreshing. What about the disappointment that comes from getting what you want? What could be the problem with inheriting a million dollars, getting engaged to your true love, signing a book contract, winning an election, or fulfilling any dream you have? More mundanely: You want a bagel. You get a bagel. What’s disappointing about that? But we keep raising the bar. What we think will satisfy us today may not satisfy us at all tomorrow. In the story of the Fisherman and His Wife, a poor fisherman catches a magic fish that implores the fisherman to save him in exchange for fulfilling a wish. The fisherman can’t think of anything he wants, so he throws the fish back and goes home. When his wife hears the story, she has lots of ideas. They could use a loaf of bread, since they have nothing to eat. The fish grants this wish, but the wife soon wants a nice house, to replace their hovel. Then she wants a mansion, then she wants to be a queen in a palace, and finally she wants to make the sun rise and the moon set. Essentially she wants to be God. You can imagine what happens next. The fish says no way, and she is very disappointed. The wish-fulfilling fish disappears, and the fisherman and his wife are back in their shack. Like so many fables, this one touches on real life desires. There’s nothing wrong with improving your life, but unfortunately, we are often unable to appreciate what we are given or achieve. We may find ourselves disappointed over and over again as our appetites increase. When the great thing we longed for doesn’t live up to our expectations, we may wonder why we wanted it in the first place. That word expectation again! Buyer’s remorse occurs, in part, because the purchased item doesn’t bring the hoped-for satisfaction. Getting what you want is also a source of disappointment because we can’t anticipate the unexpected consequences in life. There are often media stories about those who are miserable after winning the lottery. They are unprepared for people who try to scam them and for the reactions of friends and relatives who want a piece of the winnings. And while there may be a tremendous thrill to winning an election, politicians are exposed to myriad difficulties once they’re in office. Many successful celebrities commit suicide quite possibly because they’re not prepared for the challenges and disappointments that come with success. Another consequence of getting what you want is worrying that you’ll lose what you have. Bad investments, the volatility of the stock markets, and all such vicissitudes of life provide lots of room for the joys of disappointment! Often what we think will satisfy us today will leave us unsatisfied tomorrow. As we raise the bar on our expectations, we can wind up chronically unable to appreciate what we already have. And then there’s the dissatisfaction of not being sure whether you want the fish or the steak or the tofu on the menu—the ongoing disappointment that arises from not being certain what you want at all. Anything you choose means that you don’t choose something else. As we’ve all heard, when one door closes, another opens, but we often worry about the door that’s about to shut. We don’t want to make the wrong choice. The very fact of having to make a choice somehow disappoints us at a fundamental level. Why can’t the thing just come to us served on a silver platter? Yet, in the long run, the funny thing about having to choose, to make up our mind, is that even the choices that don’t seem to work out well for us have the potential for personal growth. People often speak of how adversity has fueled positive changes in their lives. The value of disappointment is often easier to perceive in retrospect. Five years after you don’t get your dream job, you may find yourself in a very successful career you never expected. However, at the moment when we’re dealing directly with major setbacks or challenges, we need to find the strength that allows us to face disappointment without losing heart. When we feel fundamentally disappointed, it can be paralyzing. We heap blame onto ourselves and we may blame the people we live and work with, especially our loved ones. This judgmental approach is expressed in a phrase like, “I’m so disappointed in you!” Ouch! Or we say to ourselves, “Man, I really messed up.” We feel like giving up on ourselves. We’re unworthy or unable to achieve anything. We feel not just disappointed but discouraged, which literally means to lose our courage. When things really don’t go our way, how do we find the courage to not give up? An early mindful perspective comes from Henry David Thoreau, who wrote in his journal in 1838: “If we will be quiet and ready enough, we shall find compensation in every disappointment.” Or as we might rephrase this: Through the quiet of mindfulness practice and being open enough, we can find benefit in every disappointment. Disappointment isn’t something we can avoid in life, but it doesn’t have to be crippling. If we have even a glimmer that our failures are as valuable as our successes, we have the beginnings of a way to work with disappointment. The unacceptable alternative is to give up. It’s far more damaging to shut down, to avoid taking a chance in life, avoiding anything risky, committed, or uncertain. Martin Luther King wrote: “There can be no deep disappointment where there is not great love.” (MLK Jr’s Letter from a Birmingham Jail, April 1963). Starting with an appreciation of ourselves and growing in our empathy for others, let us champion love over apathy. Let’s take a chance! Let’s risk disappointment! We can celebrate that we have the courage to experience both disappointment, or failure, and satisfaction, or success. At different times, you may be more preoccupied with what happened earlier, what’s happening now, or what you think and hope is going to happen. Give yourself some time to notice your thoughts and how they shape your expectations. The point here is not to manipulate your thoughts but to become more aware of them. This exercise is about observing and understanding expectations and disappointment. 1. When you have thoughts about the past, does this set up expectations for the future? For example, if you had a fight with your son or daughter this morning before they left for school, are you anticipating what will happen when they come home tonight? 2. What are you expecting to happen in the future, whether it’s later today, this week, or this year? Will you be disappointed if these expectations aren’t met? If your partner always gets you a great gift for Christmas, do you anticipate what you’ll get next year? Do you worry about whether you’ll find the right gift for him or her? 3. When you have thoughts about what’s happening now, are there expectations attached to that? Present-oriented thoughts are often based on observation. How do expectations come out of your observations? Think about a messy room in your house, filled with stuff that you and others have left there. Can you just observe that in your mind? Can you separate the observation from the plan you make to clean up? Or you might look out the window and be surprised that it’s just starting to snow. Is there a moment of appreciation, when you see those first few flakes falling, before you wonder whether you have a snow shovel anywhere around? 4. Although we all have lots of thoughts and expectations that preoccupy us, we rarely give ourselves space to see these thoughts and emotions and explore them without judging or trying to change them. What do you learn from looking without judgment? 1. Make a point of simply acknowledging to yourself when you are disappointed. Over a day or a week, notice when you’re disappointed because you don’t get what you want. 2. When you’re noticing disappointments in your life, it’s helpful to include small every day disappointments, like running out of milk for your coffee in the morning. 3. It may also be helpful to note when you are disappointed in yourself and when you are disappointed in others. If you have a few minutes – Breathe through your disappointment. Take it in and let it out. Just stopping to notice our breath for a minute can make a big difference. If you have an hour – You might spend time meditating or you might go for a walk, a swim, or a bike ride. See what happens when you give yourself some space. Bring your disappointment with you, or try to leave it at home or at the office. If you have more time – Set aside an afternoon or a whole day to practice with your disappointment. You can do this on your own or join a group retreat. Does your disappointment change when you work with it this way? One thing that might surprise you is that, if you sit long enough with even a huge or devastating disappointment, you might get bored with your thoughts and reactions to it. What’s that about? Any time – Be kind to yourself. There’s a difference between you and whatever disappointment you are experiencing. Appreciate yourself. Appreciate your bravery: Right now, when you are experiencing the worst disappointment of your life, you are there with it. It’s okay that you’re disappointed. Be kind to yourself. 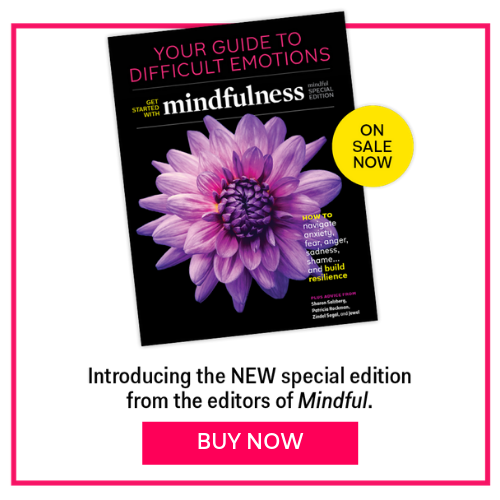 This article also appeared in the February 2015 issue of Mindful magazine. Carolyn Gimian has been writing, editing, and teaching about meditation and mindfulness for more than thirty-five years. She is a regular contributor to Mindful magazine.